Southfleet v New Ash Green - New Ash Green lost the toss, were inserted, the openers did their job P Webb (30), G Wale (20) & M Scanlan (34) and the side posted 245-4 for their 40 overs. That's the brief, the real story of the innings is Paul Sumner's first League century - coming in at No 5 and hitting a 109* off around 60 balls (19 Fours & a Six). L Saunders (37*) playing a good supporting role in their 129 partnership. New Ash Green v Old Wilsonians V - At home, also inserted after lossing the toss, the 2nd XI weren't to be upstaged by the Ones. Skipper Glen Freeman opened as usual and was assisted by contributions from all his partners as he batted through the innings to set a target of 185-4 from the 40 overs. And, more importantly, he batted through to his own first League century for the club - 104* (15 Fours). In reply, the opposition once again struggled against our bowling line up. E Quantrill (3-26), M Bushe (2-13), M Syed (2-18), K Poole (2-33) & F Quantrill (1-35) the wicket takers, catches to Poole (2), Freeman, C Whittern & B Purohit. Old Wilsonians all out for 135 and New Ash Green pushing themselves another place up the league table. With 2 league games on Saturday, and World Cup Final on Sunday, the friendly fixture was cancelled. Kent Regional League Match - 40 Overs. New Ash Green (20pts) 245-4 (40 overs); Southfleet (2pts) 107 all out (24.4 overs); New Ash Green won by 138 runs. New Ash Green made the short trip to Southfleet for this week's league game, a team they had yet to play due to the inclement weather at the start of the season. Not been much sign of that for a good few weeks now!!! New Ash Green had probably the strongest batting line up they could have, with no notable absentees, and skipper James Nash was seriously considering batting first should he win the toss. He shouldn't have worried though, as he continued his wretched form with the coin (1 win in 7) and the home side duly elected to field first so taking the decision out of his hands. Even the opposition skipper commented that losing the toss has failed to affect us this year and Nash hoped this would continue today. With a huge amount of batting talent at his disposal Nash decided to go with the regular opening partnership of Gary Wale and Pete Webb, Luke Shaw the unlucky player to miss out. It was his own fault, however, as he had failed to arrive in time for the start. Wale (20) and Webb (30) set about seeing off the new ball and Southfleet's opening bowlers, taking the score to 51 before the first wicket fell, Webb miscuing the first ball after an early drinks break to be caught. This brought Matt Scanlan to the crease and, following the dismissal of Wale and Noel Delaffon shortly after, the visitors were rocking slightly at 56-3. Scanlan was joined out in the middle by Paul Sumner, in decent form this season and on the back of a brisk 31 the previous weekend. By the time Scanlan departed for 34, the score had moved on to a far healthier 116. Nothing however, could have prepared anyone for what was to come. Sumner, on just 26 when Scanlan was dismissed, was joined by Lee Saunders and the two began to build a partnership. Sumner the aggressor and Saunders looking to give him as much of the strike as possible. Soon Sumner reached his 50, his second of the season, and with Saunders now also beginning to open his shoulders the score was positively racing along. Every bowler received some punishment but one unfortunate home bowler really had an over to forget, going for 26 runs at the hands of Sumner and multiple extras. By now, Sumner was beginning to struggle in the heat of the day but was still dispatching the home offerings to all parts. It was no surprise, therefore, when he reached his first league 100 (off about 60 balls). An incredible effort and an absolute dream to watch from start to finish. Finishing on 109 not out, and with Saunders 37 not out at the other end, Sumner had put on 129 unbeaten runs for the 5th wicket. Excellent batting from them both, especially considering the heat. For New Ash Green to put 245-4 on the board (top club score so far this season) with Dean Freeman, Joe Elisak and Luke Shaw not getting to the wicket, shows the batting strength the team had available this weekend, and how well Paul Sumner batted. New Ash Green were confident that Southfleet were not going to chase the huge target posted, but it was important that they got the job done as professionally as possible. 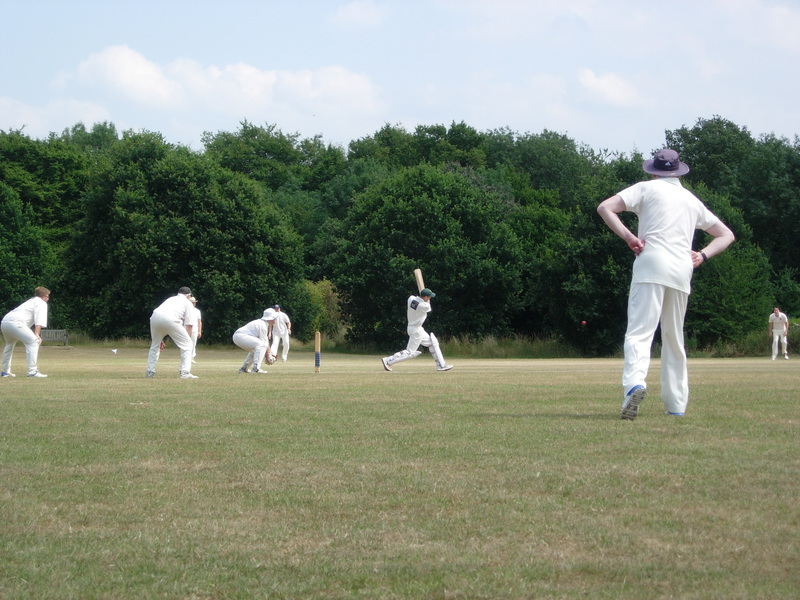 Southfleet, unsurprisingly, came out all guns blazing, on a very good batting pitch. Any loose ball from Nash & Ian Mellor was given the full treatment and the home side got off to a great start. Despite this, a couple of tighter overs meant they were now slightly behind the required run rate. Nash eventually got the breakthrough with the score on 46 but with the Southfleet batsmen still punishing anything slightly off line, they reached drinks, at 14 overs, with the score on 78. Then, just as had happened earlier in the day to Webb, the remaining Southfleet opener made a mess of a rising delivery from Nash, the first ball after drinks, and Saunders completed the dismissal with a good catch at square leg. Next man in was the unfortunate bowler who went for 26 runs in his sole over. His day was not about to get any better, bowled first ball he faced by Nash taking his 3rd wicket. (Did I mention that he also got hit in the head whilst fielding earlier in the game?) Delaffon had replaced Mellor at the other end and started off with a wicket maiden in an excellent spell of 3-12 from 5 overs. By the time Nash had completed his 10 over spell with figures of 5-38, Southfleet had slumped from 78-1 to 86-6. Elisak (2-13) replaced Nash and duly mopped up the tail with Delaffon. This time it was the bowlers showing their strength. Southfleet bustled out for 107 (less than Sumner had scored on his own) without the need for Wale to turn his arm over, though he added 2 catches to his stats. Delaffon & Webb also taking a catch each. Another great win for the First XI this time by 138 runs, showing they can win all sorts of games in all sorts of ways. Some incredible individual performances over the last few weeks, but well spread around with many different players putting their hand up and asking to be counted. A fantastic team spirit and a great team and club to be a part of. May it long continue. Kent Regional League Match - 40 Overs. New Ash Green (20pts) 185-4 (40 overs); Old Wilsonians (6pts) 135 all out (31.3 overs); New Ash Green won by 50 runs. New Ash Green welcomed Old Wilsonians to Manor Field in first game after the turn due to the away fixture against Sidcup being conceded by the hosts' - possibly due to a footy match. Reverse fixtures always have the added intrigue of coming up against previous adversaries or indeed not recognising any players, which was the case on this occasion. Old Wilsonians arrived in good time and did not seem too exhausted from their drive from the depths of South East London. Old Wilsonians won the toss and elected to field, perhaps not observing the scorecard from the previous home game in which New Ash Green racked up 199. New Ash Green prepared to bat and a few of the batsmen-in-waiting took advantage and indulged themselves by playing some croquet. Back to the business end, and openers Glen Freeman & John Howland were going about their business well until Howland was clean bowled by the Old Wilsonians' opener bowler. Next in was Matt Bushe, and he was looking good until he was dismissed by the enthusiastic first change bowler, taking an excellent caught & bowled. Munhib Syed next in and was straight into an engaging battle with the bowler coming up the hill who had more appeals than Bob Geldof. Syed took the attack to him well and was scoring freely until being caught out. Kieran Poole replaced him, looking to build on his runs from last week and set about this well until being trapped LBW. Lee Lipscombe, who we are glad to have along and making a rare appearance, had the key role of a middle order batsman: to come in with overs expiring and wickets in hand, with the sole aim of getting the scoreboard to 200. A valiant effort was made, and he can be happy with double figures not out. Whilst all this was taking place, the batsman at the other end remained unchanged. Captain-keeper-batsman Freeman was quietly, but confidently going about his business of letting people bat around him, but in the meantime, accumulating runs. So many runs in fact, that he reached 104 not out, opening the innings, and batting through for forty overs - an incredible achievement and not one that should be understated. With New Ash Green posting 185-4, an honourable mention goes to extras, second top scorer with 18, which is not too bad for the full 40 over allocation bowled. A decent tea consumed and a special mention to Mrs Syed for a homemade delicacy which was a welcome surprise. Decent bowling figures for Old Wilsonians with no one being particularly expensive, even if they didn't find much reward in wickets. The meal & cups of tea seen off and New Ash Green took to the field looking to take early wickets and put some scoreboard pressure on the visitors. Felix Quantrill opened the bowling up the hill with a maiden, but it was Poole, from the pavilion end, who struck first, dismissing the opener without him troubling the scorers. And it was Poole who struck again, seeing off the other opener, Freeman adding to his already good day snaffling the catch. Felix was not to be outdone and took the next wicket, clean bowling his victim. Three wickets down but, with the scoreboard starting to keep pace with the run-rate, a change of bowling called for after early drinks, and this provided dividends with Ed Quantrill adding to his extensive list of wickets this season. A solid catch from Poole and we were very grateful to see the back of the enthusiastic bowler from earlier (who, it should be said, took our good natured ribbing in decent spirit). A decent bat & bowler whom I suspect has turned out for Old Wilsonians teams higher than the 5ths. Syed was next to strike, Poole taking another solid catch. Ed struck again, back to back Old Wilsonians dismissals for a duck with a decent catch taken by Bhavin Purohit, solidly holding onto the ball. Syed was still doing the business from the other end, trapping the batsman LBW. With their Skipper settling himself in, Old Wilsonians got the ton up before the next wicket, Ed clean bowling up the hill. A change of bowling down the hill with Bushe coming into the attack and striking immediately, Callum Whittern holding the catch. Lipscombe replaced Ed up the hill and bowled well on his return, unfortunately returning wicketless, but good to see him back in action. It was Bushe who took the last wicket, clean bowling the opposition captain, who had batted well and diligently throughout giving his colleagues hope of an unlikely victory. Game done and New Ash Green were the victors by fifty runs against a friendly Old Wilsonians who, in the spirit of the game, wished us well for the rest of the season. With all games in the league conceded last weekend and Hartley conceding this weekend, New Ash Green finished the weekend in the green line of the table for the first time this season. With New Ash Green having a bye week and Hartley with a tough fixture against Bexleyheath, we can look forward to seeing the results after this weekend and the league table. Special mention to Paul Sumner in the Firsts also scoring a ton and helping the Ones to victory. Another four - Glen Freeman on his way to his century. For more club photos check out our gallery & also our instagram. † Club Stats Factoid: Centuries have been few and far between for the club in the last few years. The scoring of two league centuries by club members on the same day was impressive enough to raise the question 'Could this be a Club First?' From the depth of the dusty filing cabinets we can reveal that in fact it isn't. However, it is necessary to go back almost 15 years to the day to find the last time New Ash Green produced two centuries in league matches in a weekend. Which goes to show that the feat is no less remarkable, for not being unique. That occasion was 19th July 2003, when the 1st & 2nd XIs were both facing Offham CC sides and the batsmen in form were Andy Cox (121) & Matthew Quantrill (124) Reports here for anyone wanting to relive it. And if you've read this far, you might want to take a look at the D Phillips' XI v G Hampsheir's XI match earlier that same year, which features another century by the club's top scorer for that season, which seems fairly relevant. With the Annual Tour fast approaching it's worth also mentioning that that favourite ground for batsmen, Failand & Portbury produced a pair of tons within the same innings for Scott McKechnie (116) & Andy Harrington (103*) in the tour friendly there in 2009 in the only match of that wet,wet,wet tour which sort of almost got to a result, kindof.